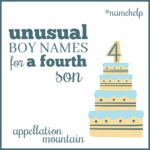 Rare boy names range from the familiar, but seldom heard, to the truly novel. Rank comfortably outside of the current Top 1000. In practice, that means that most of these names were given to between 75 and 150 boys last year. Feel nicely on trend. It’s not crazy to imagine meetings boys with any of these names. If anything, it’s a surprise we don’t hear them more often. While these names qualify as different, it’s a mistake to call them weird. Fewer than 80% of all boys born in 2015 received a Top 1000 name. The Social Security Administration gives the exact figure for 2015 as 78.81%. It is even lower for girls, bringing the overall percentage for all children born in 2015 to 73.48%. In other words, one out of every five boys answers to a name that isn’t in the Top 1000. And many of those names will surprise and delight a lover of rare boy names. Here are a dozen of the best. Caspian – CS Lewis makes this name literary. He borrowed it from the map. The Caspian Sea traces its name back to a long-list tribe. Rich with story, Caspian feels like an adventurous, interesting, and yet very wearable name for a son. Evander – Evan has been a steady favorite in the Top 100. Ancient Alexander is a modern Top Ten pick. Evander sounds like a smoosh of the two, but actually traces its roots to a Trojan War hero. The name is sometimes considered a cousin to the Scandi-by-way-of-Scotland Ivor, based on sound alone. And yet Evander has appeared in the Top 1000 just once, way back in the 1890s. Ezio – Parents love Luca and Mateo and Marco, too. So why not this romance language name? Perhaps it’s simply too obscure. While we all know Luke and Matthew and Mark, Ezio comes from Aetius, an old Roman name. The Roman name means eagle, so that’s a bonus. And yet, it’s definitely not well known. Still, Ezio mixes the edgy ‘z’ with an upbeat ‘o’ ending, and feels every bit as cool as Arlo or Milo – possibly more. One of Zoe Saldana’s twin sons is named Bowie Ezio. Finnian – Once reserved for fictional fish, Finn feels like a go-to name for a boy in 2016. Borrowed from Irish myth, Finn stands on its own. But longer forms of the name abound, including Finley and Finnegan. The name of an early medieval saint, Finnian bridges the familiar Finn and more obscure Irish picks. Ike – We’re mad for Jack and Luke. Ike shares their hard ‘k’ sound, a masculine, no-nonsense vibe. But while Jack feels timeless and Luke ranks as a modern staple, Ike remains an underused gem. 34th President of the United States, Dwight D. Eisenhower, answered to Ike as a nickname, and his campaign buttons included the slogan “I Like Ike.” It makes for a friendly, upbeat, and yes, retro, choice. Jarvis – Lest you dismiss Jarvis as too country bumpkin, remember that it is the impossibly high tech system behind Tony Stark – aka Iron Man’s – empire. Paul Bettany voices Jarvis in The Avengers movies. Jarvis hugged the fringes of the US Top 1000 until a few years ago. 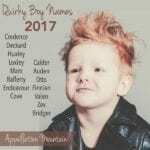 Now it’s seldom heard, but might make an intriguing option for parents in love with s-ending boy names like Atticus and Brooks. It comes from Gervase, an early saint’s name probably derived from the Germanic element ger – spear. Penn – Short boy names like Finn and Jax seem very on-trend today. So how ’bout Penn? There’s been a magician by the name, plus young actor Penn Badgeley. It brings to mind Pennsylvania founder William Penn, and also suggests literary pursuits. (Is that last one a stretch? Maybe … ) And yet, Penn remains among the rare boy names. Reef – Words make great candidates for conversion to names. They’re familiar, and therefore easy to spell and pronounce. But many of them remain rare as given names. I think they work best when they’re not used in every conversation. Table and Shoe don’t feel like names. But Reef? Yes! A nature name that shares sounds with popular choices like Reed, Reef might wear wonderfully. Roscoe – At least a dozen places in the US are named Roscoe, and a smattering of athletes and musicians answer to the name, too. Originally a surname, Roscoe feels very different than classic Carter or upbeat Riley. We tend to think of The Dukes of Hazzard’s bumbling sheriff, an association that makes this name lean hick. And yet, this name is so far out that it’s almost in. If Milo and Arlo make the list of stylish names, Roscoe can’t lag far behind. Torin – File Torin with the underused Irish choices. The name boasts a great meaning – chief! – and an on-trend sound. With so many two-syllable, ends-in-n names for boys in the current Top 1000, how can it be that we’ve overlooked Torin? Wells – I think boy names ending with s are having a mini moment. Think of surnames like Brooks and Ames, and ancients like Atticus and Julius, too. Wells fits in with all of those W surname names – Walker and Weston and Wilder. Maternity concierge Rosie Pope welcomed younger son Wellington “Wells” Reade Pope in 2011. 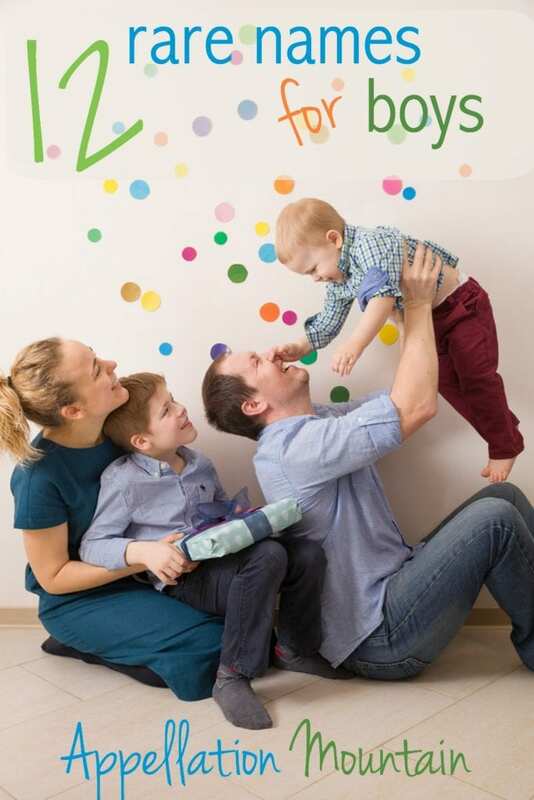 Zev – Zev first caught my eye back in 2008, when Marissa Jaret Winkour welcomed son Zev Isaac. Winkour – best known for playing Tracy in the Broadway version of Hairspray – is Jewish, and Zev is a Hebrew name meaning wolf. It’s a cool and edgy name, but presumably a heritage choice, too. Now, though, Zev might feel familiar to a new generation of parents, thanks to a character in The Lunar Chronicles. A sci-fi spin on all of our favorite fairy tales, one of the Lunar Chronicles stories recasts Little Red Riding Hood, and gives the name Ze’ev to the wolf. 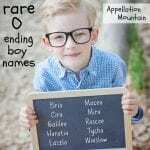 Would you consider any of these rare boy names? Are there others that you would add to this list? PS – Love this list? Read the girls’ version here! Oh wow, two of these were in our boys list! And I think Ezio is rising because he’s the hero of a popular video game, soon to be a movie (Assassin’s Creed). Also, just met a baby Lloyd at the library. So adorable. I’m not sure if it falls outside the top 1000 but if it does then I would add Stellan to the list!